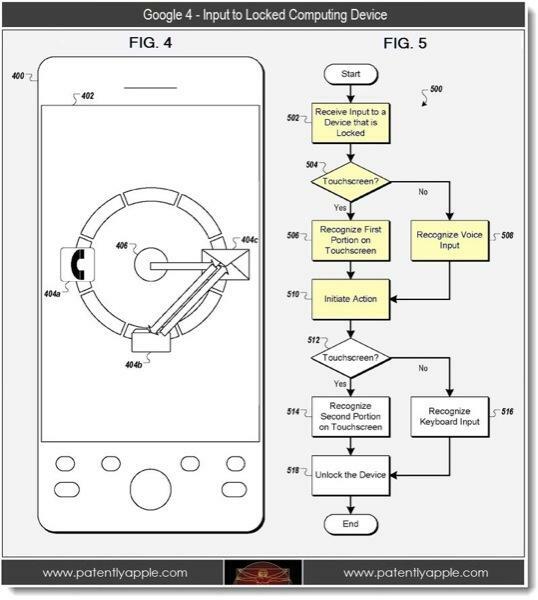 Following a key Apple court win against Motorola in Germany over a 'slide-to-unlock' patent, Google last week saw its own unlocking patent filing from 2010 published by the U.S. Patent and Trademark Office. Google's original patent, titled "Input to Locked Computing Device," describes methods to unlock a device through a combination of touch or voice inputs, and could possibly be the answer to Apple's litigation regarding 'slide-to-unlock,' according to Patently Apple. This iteration of lock screen input, first filed for in August 2010, varies from offerings like Apple's 'slide-to-unlock' in that it doesn't necessarily bring the user directly to the home screen, but instead executes at least one command such as making a phone call or opening an app. The subject matter of this specification can be embodied in, among other things, a method that includes receiving at a computing device that is in a locked state, one or more user inputs to unlock the device and to execute at least one command that is different from a command for unlocking the device. The method further includes executing in response to the user inputs to unlock the device an unlocking operation by the device to convert the device from a locked state to an unlocked state. The method further includes executing the at least one command in response to receiving the user inputs to execute the at least one command. The at least one command executes so that results of executing the at least one command are first displayed on the device to a user automatically after the device changes from the locked state to the unlocked state. The implementation of the patent could involve complex interaction with icons on a lock screen that would be difficult to perform accidentally. Google gives the example below of a circular interface with three icons that can only be unlocked with multiple dragging actions, in this case the unlocking of a mail app. Alternately, touch input can be used with voice input to unlock the device as seen in the operations flowchart. It remains in question whether the added layer of command execution varies enough from Apple's prior art of 'slide-to-unlock' to afford Google the rights to the new patent, however the USPTO's publication can be seen as a step in that direction. Apple recently won a German injunction against Motorola over the company's slide-to-unlock patent, which has forced the RAZR maker to rethink its implementation of the lock screen inputs. With Google on the verge of completing a buyout of Motorola Mobility, the internet giant will soon have a higher stake in the seemingly endless patent war currently being waged around the world.